A few miles east of Bennett, CO a train horn sounds through the night. The light from the headlamp of the train can be seen for a mile, as it’s heading down the track. The residents of the town are familiar with this train. It’s Engine No. 51 pulling a load of over twenty cars, barreling down the track towards the bridge spanning Kiowa Creek. However, this train will never pass. Even though it’s seen and heard, it’s been laying under the sandy depths of Kiowa Creek for over 130 years. May 21, 1878 bought heavy rains to eastern Colorado which flowed into the creeks and rivers such as Kiowa Creek just a couple of miles east of Bennett, then called Kiowa after the creek. A train was heading east, just passing the town at the same time the waters in Kiowa Creek became so great that they took out the train bridge. Unfortunately, the engineer of the train didn’t see the warning lights in time and the train went over the broken bridge, plunging into the water below. All of the crewmen and many passengers died. Over the next few days, the bodies and train cars were recovered; however, the locomotive was never found, having been buried within the quicksand of Kiowa Creek. The engineer, Mr. Bennett, was one of the many who lost their lives. The town was soon renamed Bennett in his honor. 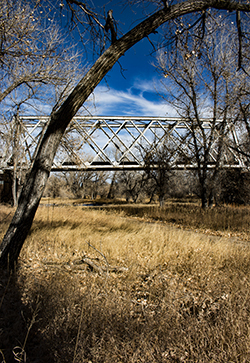 The bridge was repaired, years past and the memory of the horrible tragedy and the train laying below the surface faded, but to this day, the ghosts of the lost locomotive can be seen and heard near the banks of the now dry Kiowa Creek.